Hello all! Well, it’s Friday. I’m so glad this week is over. I wish there was some way…some magical wand that could be waved…to block this week from our memories forever. If you follow the A2D Facebook Page, then you might have seen my post about Matt’s brother, who died very suddenly and unexpectedly last Sunday. It’s been a tough road this week, that’s for sure, but Matt is doing much better today, reminiscing, laughing at funny memories, and processing. I really do appreciate all of the kind comments and prayers this week. Soooo, that’s been the reason that things have been a bit slow around here this week. And that’s also the reason that I need a big, huge dose of happiness! And what makes me happy? Seeing your projects, of course! I want to see anything and everything that you’ve made with your own hands—everything from home décor and room makeovers, to recipes, clothing, accessories, etc. Anything goes. If you’ve made it, link it up! Ready to link up? It’s easy! Take a look at other projects linked up here, and be sure to leave comments so they know you’ve visited!! Psst…Want to get sneak peeks and behind the scenes looks at my projects? Come join us on the A2D Facebook Page! so sorry to hear about your familys loss. So very sorry for your loss. Prayers for you and your family. Oh WOWZA! So glad I found your blog! I just linked up for the first time! Thank you so much for hosting! Found you from Jen's (TTaJ) twitter post. 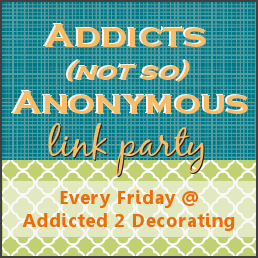 Thanks so much for hosting this link party. So sorry to hear about your family tragedy. Wishing you all comfort in the days ahead. I was so sorry to hear about Matt's brother. Thoughts and prayers are with all of you. I am glad you were all able to find some smiles amid the grief. I am so sorry for your loss. My brother passed away 2 1/2 years ago and it is still so hard. Matt will definitely need your love and support through this difficult time. Your family is in my prayers.